This article is about Coptic Orthodoxy in Australia. For Copts in Australia. For a list of Coptic parishes in Australia, see the List of Coptic Orthodox Churches in Australia. Congregations of the Coptic Orthodox Church in Australia are served by two Coptic Orthodox Dioceses with over 50 parishes, three Monasteries, two theological Colleges and four schools. 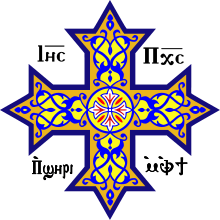 The Coptic Church is a member of National Council of Churches in Australia. According to the 2006 Census of Australia, there were a total of 19,928 followers of Coptic Orthodoxy nationally. Currently, the Coptic Orthodox Church has as many 100,000 members in Australia (in Sydney alone it is estimated that there are 70,000 Copts, with numbers in Melbourne in the tens of thousands).